You may wonder why we have the readings each week that we have. They are chosen for us by an international ecumenical body called the (snappily named, I think) International English Language Liturgical Consultation. Back in the 1990s, it took the Roman Catholic three cycle of bible readings for each Sunday of the church year, and blended them with different Protestant cycles of readings and came up with something called the Revised Common Lectionary, which is a three-year cycle of biblical readings that takes note of the rhythms of the church year, and designates readings for each Sunday. The Episcopal Church is one of the denominations which uses this cycle, the Revised Common Lectionary. Basically, what it means is this: that most of the major established denominations around the world have agreed to read the same passages of scripture on any given Sunday. And that’s huge. It means a great deal to know that pretty much whatever church you go into, whether its Roman Catholic, Lutheran, Presbyterian, Episcopalian or whatever, you’ll get the same readings. And what is included in the cycle each Sunday is this: a reading from the Old Testament, a reading from the New Testament other than the four gospels, a psalm, and a reading from one of the four gospels. Now, the only reading we are obligated to have at a Eucharist is one from one of the four gospels, so we have the choice of whether or not to include the other options. And generally, we do. And here’s the thing about those readings prescribed in the Revised Common Lectionary: it means that over the course of three years, you get to hear a massive chunk of the Bible. If you have been attending church for at least the last three years, you will have heard a lot more of the Bible than you imagine that you might have done. Now think about the denominations that are caricatured as Bible-thumping, such as Baptist, Pentecostal, independent and so on… the irony is that they generally read a lot less of the Bible in their services that those churches that use the Revised Common Lectionary. Interesting, huh? Very educational, these sermons, no? And here’s another thing about the Revised Common Lectionary. All of the readings tie into each other in some kind of way. Sometimes it’s less obvious than at other times, and it’s the preacher’s job to elucidate the connections between the readings. So, today what connects all of our readings is this: they are all about the inclusiveness of God’s salvation: that God’s salvation is accessible to anyone, without the need for prior conditions to have been met. Irrespective of background, culture, gender, sexuality, economic circumstances, ethnicity, learning, and every other marker and stratification that we humans use to classify and exclude, God’s kingdom is available freely and completely, without exception. One of the markers of humanity throughout human history is our obsessive need to classify and group other people. We seem, for some reason, to find it very difficult to relate to other people if we cannot sort them into categories. God knows that we all do it. And this town does it, and our schools do it, and our workplaces do it and, sadly, many of our houses of worship do it. All of those subtle and not-so-subtle markers that we use to identify ourselves to others as being of a like-mind and status, which also are designed to exclude anyone who is not like us. Out clothes, our cars, our language and speech, our mannerisms and our body language. Let’s take the time to analyze ourselves, and count the myriad ways in which on a daily basis we use those nuanced markers to classify, to group and, sadly, to exclude. When Jesus says that his kingdom is not of this world, he is saying so because God’s kingdom is so fundamentally different from the way that our human societies are usually organized. The kingdom of heaven is so egalitarian that it doesn’t even need to use the word ‘egalitarian’. The apostle Paul had been busy setting up a bunch of churches in the western Mediterranean. Turkey, Greece, Italy, the Holy Land. I’ll say this for the apostle Paul: he knew how to pick a nice spot for his churches! One of those churches that he set up was in what is now central Turkey and was known at that time as Galatia, a Roman province. And Paul spends the majority of his working life on the road traveling between all of these churches. In his absences he wrote long letters to his assistants that ran the churches, with all manner of advice and teaching and it is from his pastoral letter to the church in Galatia that we heard today. His pertinent advice in his letters is almost always pertinent in some way today. Not always, but usually. Who were the people who gathered to these young churches that Paul and his associates had set up? It depends. In the Holy Land, it was usually people who were already Jewish and, so, if you read Paul’s letter to the Hebrews, you will find that it makes that assumption, and uses a lot of analogies and arguments that would make sense if you were already Jewish. 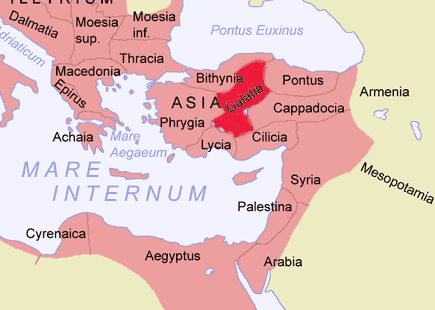 In other places, there was less likelihood that the members of the churches would have already been Jewish, such as in Galatia. And here, what we see happening, in this young church, is the human obsession with classification, grouping and exclusion. In Paul’s absence, there have been visiting preachers – Jewish, like Paul – who have taken a much more hard line on the qualifications required to be a Christian. These visiting preachers infer that since Jesus and his disciples were fully Jewish before becoming Christian, God would require all would-be Christians to become Jewish first. In other words, they are saying that the salvation of Christ is only open to Jews. The apostle Paul gets wind of this and the very opening of his letter to the church in Galatia deals with this issue, giving us a good clue as to how big a deal this was. Paul, in fact, is seeking, as a church leader, to nip this dangerous teaching in the bud. God’s salvation is for everyone, and there is no need for any pre-conditions. One of the stories from Jesus’ life which would have been in Paul’s mind when he wrote to the church in Galatia was the one that we have heard this morning from St. Luke’s gospel – the story of Jesus with the Roman centurion. Briefly to recap, a Roman centurion – that is, an army commander with 100 men under his command (hence, centurion) comes to Jesus because he has a beloved servant, or slave, in his household who is perilously sick. He senses that Jesus will be able to heal his servant. Jesus is so taken with the faith that the Roman centurion has in him that all that is needed is a word from him and the servant is healed. Jesus comments that he has never found such faith in anyone, including among the Jewish people. And here is the really crucial detail: the Roman centurion was not Jewish. Jesus ministered to the centurion’s servant and, by extension, to the centurion himself without the slightest regard to his ethnicity, prior faith background, or any number of other obstacles that human society might have put in the way of the centurion. In short, Jesus saw human beings created in the image and likeness of God. So there’s always room for us to remember both the story of Jesus and the centurion, and Paul’s teaching to the Galatians. We always need to be conscious of our human tendency to classify, group and exclude, and to remember that the Kingdom of God acts counter to those impulses. We often do a pretty good job of trying to remember those pitfalls but, before we congratulate ourselves too much, let’s also remember that there are countless people out there who are longing for a connection with God - a connection that we could help them to have, incidentally – who make all sorts of assumptions about churches: assumptions about the way that we would expect them to look, to behave, to believe. Even if we don’t expect those things of people, there is an assumption that we might, or would. And one of the challenges that we face as churches, is how we counteract those assumptions. Because it’s a tragedy of monumental proportions that anyone would feel that for some reason they would feel uncomfortable or, even, unwelcome in church. Yet, I know it to be true that this is how some people feel, and I hope that wherever, and whenever we can, we reflect the unambiguous inclusiveness of God’s kingdom.